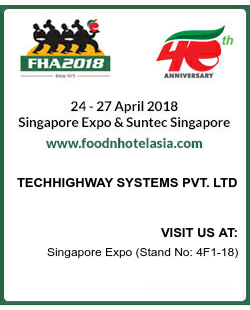 TechHighway Systems is all set to debut its presence at Food & Hotel Asia 2018 (FHA 2018) to be held at Singapore from 24 – 27th April 2018. More than 4000 exhibitors will showcase their products related to IT industry and TechHighway will be participating in the Hospitality Technology Expo which will be held at Singapore Expo Convention and Exhibition Center. TechHighway will be located in hall 4 at Booth Number 4F1-18. TechHighway is going to present all its Hospitality domain services for which it is famous in US, Canada, European & Middle East market. We invite you to join us at FHA-2018 and know our products better.